SeeDOS provides the world-famous Exradin ion chambers. For over 25 years, Exradin chambers have provided uncompromising quality, scientific integrity and dependability. Exradin ion chambers are waterproof, fully guarded, and the chamber electrodes are made entirely of homogenous conducting plastic, providing excellent conductivity. For more information on Exradin products click here. Exradin ionization chambers are available from SeeDOS for a wide range of dosimetric measurements in diverse radiation beams. The chambers find applications in the fields of radiation therapy, diagnostic radiology, and radiation protection and research. Applications for which Exradin chambers are suited include beam calibration, quality assurance, dose assessment, depth-dose studies, mixed field dosimetry, monitoring, background measurements, and a variety of research studies. The Exradin Miniature Shonka Thimble Chamber provides a perfect balance between fast scanning and point dose measurements within 1 cm in water, air, or other phantom material. Model A1, REF 92705 is completely characterized in TG 51 and TRS 398. The chamber features exceptional spatial resolution for relative dosimetry scanning and is capable of measuring small field sizes of 6 mm by 8 mm for accurate point dose measurements. Its waterproof construction and two piece removable stem makes it ideal for use in water phantoms. The chamber vents through a flexible tube that surrounds the triaxial cable, ensuring the collecting volume is in pressure equilibrium with the surroundings. The design assures there are no stem or voltage soakage effects, providing precise and reliable measurements. High Voltage Connector: Integral with triaxial connectors (shell of chamber is common with connector body). 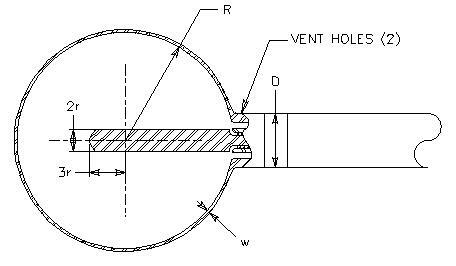 Venting: Vented to the ambient via the flexible vent tube surrounding the triaxial cable. If you are interested in any of the products mentioned here, please fill out an Enquiry Form or Go To the Ion Chamber Product List / Quotation Request Form, so that we may promptly respond to your request. The Exradin Miniature Shonka Thimble Chamber provides a perfect balance between fast scanning and point dose measurements within 1 cm in water, air, or other phantom material. The Model A1SL Thimble Chamber is the Slim-Line version of Model A1. It has the exact same internal dimensions and collecting volume as the Model A1, yet the entire chamber has the uniform diameter of 6.4 mm (0.250"), which is ideal when using a small phantom. The chamber features exceptional spatial resolution for relative dosimetry scanning and is capable of measuring small field sizes of 6 mm by 8 mm for accurate point dose measurements. Its waterproof construction makes it ideal for use in water phantoms. The chamber vents through a flexible tube that surrounds the triaxial cable, ensuring the collecting volume is in pressure equilibrium with the surroundings. The design assures there are no stem or voltage soakage effects, providing precise and reliable measurements. The Model A1SL is constructed of rugged C552 Shonka air-equivalent plastic, providing excellent conductivity and years of reliable use. Stem: Integral with chamber; Aluminum, 0.246 in OD by 4 in long. Other lengths available upon request. The Spokas Thimble Chamber permits the precise measurement of exposure and air kerma in photon beams and of absorbed dose in photon, electron, proton, neutron, and mixed photon-neutron beams. Its waterproof construction and two piece removable stem makes it ideal for use in water phantoms. The chamber vents through a flexible tube that surrounds the triaxial cable, ensuring the collecting volume is in pressure equilibrium with the surroundings. The design assures there are no stem or voltage soakage effects, providing precise and reliable measurements. Exradin Shonka-Wyckoff Spherical Chambers are designed for the precise measurement of radiation exposure and exposure rates. They are easily centered for precise positioning and are excellent for in-air measurements. The design assures there are no stem or voltage soakage effects, providing precise and reliable measurements. The Spherical Chambers are constructed of rugged C552 Shonka air-equivalent plastic, providing excellent conductivity and years of reliable use. Vent Holes: Two holes, open to the ambient, are located on the neck of the chamber. Stem: Black phenolic, 9 in long. See table for stem diameter. Special stem arrangements are available upon special request.